Two months ago tomorrow, a Saturday morning on the 12th of June, Kirsten Malone was up early, biking through Boston to work on yet another art project, one of many she’d made in her 29-year life. 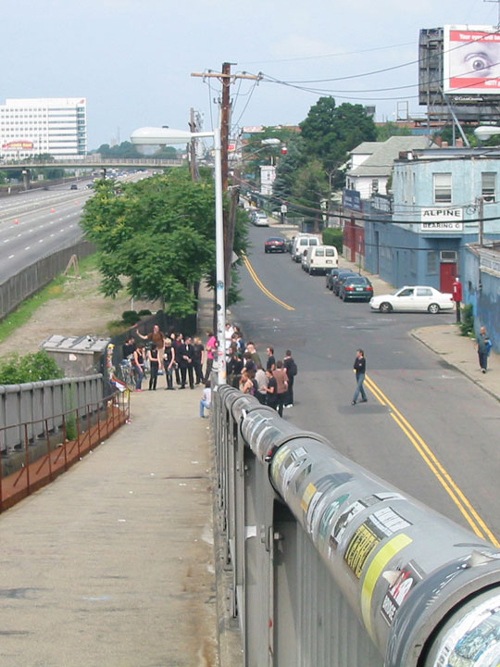 At the intersection of Lincoln & Franklin Streets in Lower Allston, at the bottom of the caged footbridge over the MassPike, she collided with an unseen car. Her injuries were too severe, and she wouldn’t recover. 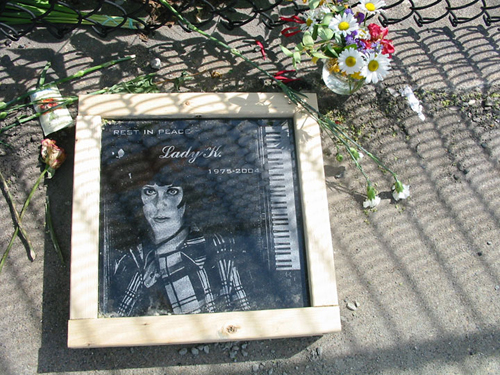 In the early hours of Wednesday the 16th of June, Lady K was gone. I didn’t know Kirsten Malone, but I sure knew her face. She was one of the familiar crew of local show-goers, people I’d cross paths with a couple times a month, characters who always stood out from the crowd. It wasn’t just at shows that I’d notice her… it was on the streets, on her bike, as I passed her in my car or she cruised by as I walked. We had some mutual friends, more than I’d realized, and it would take her death for me to learn that. I’d heard some good things about her band, the Faux, but had never seen them. I would’ve walked into some club and thought “Ah ha! It’s that biking girl behind the keyboard!”. I just wish I’d had the chance. The week she died, before I’d heard about the accident, I first noticed all the flowers and candles appearing by the footbridge, just a short block from my house. I turned that corner in my car, wondering briefly about it on my way to work. When I read about the accident, when I saw her picture, and then learned exactly where it happened… it hit me. And it hit far harder than I would have expected, especially for someone I didn’t actually know. Reading the outpourings of emotion on messageboards, the articles about her, finding out about our shared friends… I felt a real loss, and part of me felt I didn’t even deserve to feel it. I thought about those who were really close to her and can’t even imagine what they were going through, must still be going through. But here I am anyway, finally writing some words for her, hoping that her family and those who knew her well are doing ok. After she died, Amie and I joined some of her friends at the site of the accident to remember her. 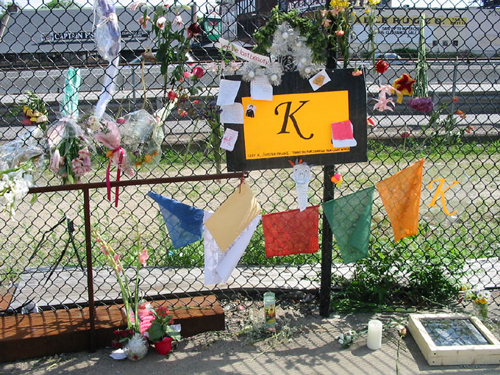 Goodbye notes, pictures, little memories of her life surrounding a big orange sign that simply said “K”. 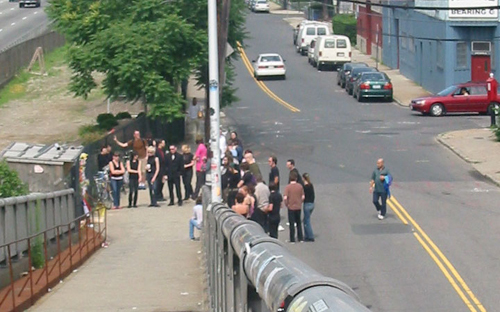 That makeshift memorial at the foot of the bridge is gone now, nothing left but a few ribbons and tattered bits of string hanging from the fence. I still think about Lady K on her bike every morning I pass it, though. Maybe I always will. Wondering if some kind of permanent memorial for Kirsten would even be possible, I spoke with someone at City Councilor Jerry McDermott‘s office a few weeks ago. Not surprisingly, I wasn’t the first person to ask about this, and even though memorial plaques or streetsigns are usually reserved for veterans, it looks like something for Kirsten could actually happen (much like the corner at Brookline & Mass. Ave. being named for Mark Sandman). I also found out that Kirsten’s death has finally triggered some much needed change at that dangerous intersection where Franklin & Lincoln Streets meet. Living so near to it, I’ve seen the evidence of more than a few accidents, and been involved in some close calls myself. There’s no signal, no stop sign, not even a crosswalk at the bottom of a bridge that gets a ton of foot and bike traffic. I take a risk every time I pull out from Franklin onto Lincoln, hoping that a car isn’t speeding towards me, completely obstructed by cars parked too close to the corner. Thankfully, a special public hearing has been called, to take place at 5:30 pm on Monday, September 20th at the Honan-Allston Library on North Harvard Street, where possible improvements to that intersection will be discussed. I’ll be there, and hopefully so will many of my neighbors. At the same meeting, Councilor McDermott will present a drafted order requesting a permanent memorial for Kirsten. The council will consider the request within a week or so, and if all goes well, something could be in place by early fall. I know I’d be proud to live near “Lady K Corner”. A few days before the hearing, on Thursday, September 16th, a special show in Kirsten’s memory will take place at the Middle East Downstairs. Proceeds will help her band, The Faux, release a record they were never able to during their time as a band. In turn, money from sales of those discs will go to a scholarship fund at Mass Art for young female artists. The lineup for the show is Neptune, Gold, Mahi Mahi, Fat Day, U.V. Protection, Plunge Into Death, Cathy Cathodic, and Shore Leave, and the doors are at 8pm. The original discussion thread from the Honeypump messageboard. A gallery of Kirsten photos at Plastique People, where I got the first photo above.